The Romney and Obama campaigns have been firing off a series of volleys at eachother over the question of what exactly Mitt Romney's involvement with Bain Capital was during the period from February 1999 through 2002. The Boston Globe defends the Obama Campaign claims here, while FactCheck.org has defended Romney here. Why do we care? There are, at this point, two reasons: first, several of Bain Capital's investments went sour over that period, leading to thousands of jobs lost, several bankruptcies, and a fair number of jobs being outsourced overseas. The Obama campaign has used these unfortunate events in campaign adds to highlight their view that Romney is not someone who knows what it takes to create domestic jobs for Americans, while Romney claims that they prove nothing at all, because he was not at Bain during the period when they happened. The second, and perhaps more significant reason we want to know is because in 2002 as Romney was gearing up to run for Governor, Romney signed sworn statements to the state of Massachusetts testifying that he had no active involvement in managment or operations of Bain Capital since February 1999, which would represent a felony punishable with prison time if not true. Romney was paid at least $100,000 in employee compensation after the February 1999 date before his official resignation in 2002. According to legal experts, including both current and former heads of the SEC as well as law professors elsewhere, there is no real evidence that Romney has committed a felony, since the statement he signed in 2002 only declared that Romney had no active role at Bain since 1999, not that he was not legally the CEO over that period. However, all the legal experts have noted that if Romney's story is true--that he was legally the CEO, President, Chairman, sole stockholder, and Managing Director, but had no active involvement in management or operations at the firm from 1999 to 2002--then he and Bain Capital could potentially be liable to civil suits from Bain's investors, if he or the firm misled investors into thinking that Romney was actually managing their money over that period. Although the evidence shows that Romney was not explicitly listed as part of the management teams of any of the individual investment funds from 1999 to 2002, this does not fully absolve them from liability, since investors certainly had a right to know if the CEO of Bain was on a leave of absence, and who was actually calling the shots. Paul Krugman bemoans democrats that have cautioned against going after Romney's record at Bain. However, those democrats do have a legitimate concern--if the election becomes entirely about Obama versus Bain Capital, then Romney may well become the next president. Now, that would change if it turns out that Romney actually did have active involvement during the period in question, since that would make his testimony in 2002 a felony and, to the best of my knowledge, Andrew Jackson is the only felon successfully elected president (he killed a man). On the other hand, Romney's experience at Bain Capital is fair game for politics, even if it may not be Obama's winning strategies. Some people have tried to claim that the Obama campaign has been unfair by attacking Romney's character, but I think that this "fairness" critique is unfounded and meant to silence what is and should be part of the discussion. First and most importantly, Romney's time at Bain Capital, as its CEO, is professional, not personal. It is completely fair to criticize a politician's professional experience. Second, even if you want to assert that Romney has some right to leave his time at Bain out of the election, he has explicitly waived that right by trumpeting his Bain experience as his main credential for being president. In fact, there isn't a whole lot else to Romney's record--unlike Obama, who had been in politics for more than 20 years prior to running for President (including more than 10 years holding elected office), Romney has only a brief four year term as governor of Massachusetts on his professional resume. Finally a bit of meta: why all the focus on whether some of Bain's investments went sour after 1999? Bain Capital was a private equity firm. Losses are extremely common in that industry--roughly 60% to 70% of the companies Bain invested in while Romney headed it went bankrupt within five years, so I have a very hard time believing that the losses after Romney left were the only ones we could dig up. In addition, it is worth noting two things: first, that 60% to 70% is not high. In fact, it is a bit lower than the industry average, which sometimes goes as high as 90%--generally it is only about 10% of the investments that firms like this make that generate all of their profits, and make up for losses on the remaining investments. Second, attacking failures between 1999 and 2002 is a cheap shot, whether or not Romney was involved, since the economy went into recession in 2001, through no fault of Mitt Romney or Bain Capital. Lots of companies went bankrupt; lots of workers lost jobs. That's just what a recession is. Now that I've defended Romney, let me attack him. 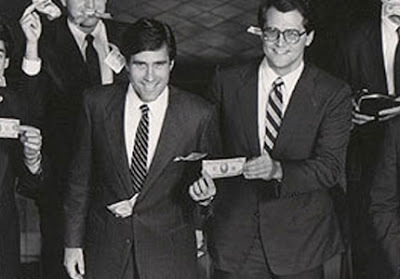 Suppose we take Mitt Romney at his word, that he had no active role at Bain Capital after February 1999. Isn't this, by itself, incredibly irresponsible for Romney to continue to be the company's CEO, chairman, president etc. without actually doing any of the work, nor appointing a successor? Normally, a company's board of directors would insist that the CEO resign and appoint an interim CEO to take the reigns if the current CEO wants to take a "leave of absence." Not so at Bain--since Mitt Romney owned 100% of all the stocks, no one could force him to resign while he was away from the company. In short, Romney treated Bain Capital, an organization with control over $4 billion of other people's investments and the tens of thousands of workers at companies it invested in, as his own personal hobby, leaving it leaderless when he found a new hobby in public life. He should have known better, and either resigned from Bain in 1999 when he left, or turned down the job at the Olympic Organizing committee.